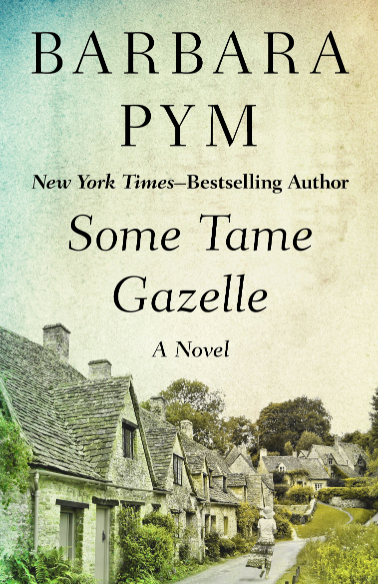 I’ve seen French crime writer Pascal Garnier mentioned on so many blogs that I could no longer resist and had to read him. 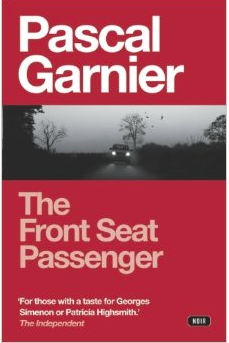 La place du mort – The Front Seat Passenger seemed like a good choice as it’s short and the story sounded intriguing. Fabien loses his wife in a car accident. Until that day he thought they were fairly happy. At least as happy as you can be when you’ve been married for a long time and have taken the other one for granted. Still, finding out she wasn’t alone in that car but with her married lover comes as a bit of a shock. While he may not be mourning her, he’s outraged and comes to the conclusion: If that guy took my wife – I’m going to take his widow. And he starts to pursue the other man’s wife, follows her, observes her, enters her apartment. After his wife’s death he moves in with his divorced friend Gilles. Both men are unemployed and spend their days playing with Gilles’ small son, looking out of the window, smoking pot. Their playful cohabitation is often interrupted by Fanchon, Gilles’ ex-wife, who doesn’t think it’s funny that the two men behave as if the weren’t any older than her small kid. It’s a hilarious set up. Fabien is anything but likable. He’s sarcastic, frustrated, acerbic. His comments and observations are a lot of fun. Not everything is amusing though. He may be astute when it comes to others, but he doesn’t seem to have a good feeling for himself and so, after a while, the reader feels uneasy. The writing is surprisingly good, placing this crime novel firmly among the more literary of its kind. I really liked how he included small details – like the movements of pigeons on a windowsill, for example. The first hundred pages of this book were really excellent but unfortunately from then on it went downhill. What started as a great contemporary French crime novel turned into a Hollywood plot. Think “Misery” with a twist. I have no idea why Garnier chose to flush his original story down the toilet. I can’t imagine he couldn’t come up with another idea for an ending, so it must have been a deliberate choice. I’m just not sure why. Not one of the other reviews I read had a problem with the end. I have to admit, the writing is so good, that I, too, was tempted to forgive the end but I failed. Because the first hundred pages were outstanding, I’ll be reading more of him. I just hope the next book will not be such a mixed bag. Here are two more favourable reviews by Guy here and Emma here. I really liked this (as you know) but it wasn’t my favourite by any means. Try Moon in a Dead Eye. Garnier novels have slash and burn endings IMO. This ending was a tad too familiar. I’ve read similar endings. Si I was disappointed but the first 100 pages were really, really good. I’ll try another one. And sorry – I forgot the links. Will add yours and Emma’s reviews. Funnily enough the book reminded me vaguely of a film but I can’t recall the title. Only Misery came to mind but I had the feeling I’ve read a similar novel. Oh dear – I hate it when a book lets you down like that. Don’t think I’ll be hurrying to read this somehow! He’s written a lot and quite a few of his book have been translated. If you like acerbic, you’d like it. I don’t suppose all of the endings are like this. Just skimmed your review for now as I read this book fairly recently and I’m in the process of documenting my thoughts. I’ll drop back for a proper read once my review is up (it might be a week or so as I’ve got a bit of a review backlog!). OK, I’ll be watching out for it. I hate bring let down by an ending when a beginning promised so much, how disappointing. What a shame. To waste all that good writing! I’m hoping his other novels don’t have the Hollywood ending. I find myself wondering how they got “front seat passenger” from “place du mort.” Interesting translation. Ah that – in French “la place du mort” is the seat next to the driver. Guy mentioned in his review that it’s called “driving shotgun in English” – so that would have been a better title. I would still recommend this. But the again – he’s written a lot more. It wouldn’t have been a bad choice for a title. A clever title in French, hard to translate. I agree. Riding shotgun would have left out the other meaning. It’s so annoying when a novel starts out really well and then falters. I hope the next one of his you try doesn’t have a formulaic Hollywood ending. I wonder why writers do it? Maybe they run out of inspiration or time and have to go the easy route? I have no idea why he wrote it like that. Maybe that’s his still – write very realistically and the go overboard at the end? I’ll have to find out. Nice review, Caroline. Wonderful to know that Garnier’s writing is so good. But sorry to know that you were not happy with the ending. It is sad when writers change track in the middle of a book and take it along predictable lines. I love the French title of the book. The English title loses a lot in translation – I think the English translator wanted to make things more explicit but because of it the title lost its implied meaning and beauty. Sometimes I feel so frustrated when English translators do that – try to explain the meaning of a phrase precisely and not letting the implied beauty stay and let the reader figure it out themselves. I hope you enjoy your next Pascal Garnier book more. I couldn’t write more about the ending but it’s the type of ending I’ve seen before and it just annoys me. 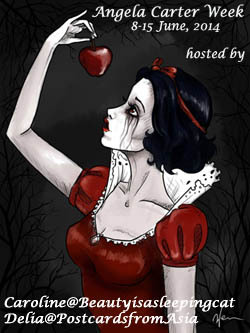 I really dind’t like “Misery” (the movie) either. Gallic books is a pretty great publisher. Not sure why they chose this title. It’s bland compared to the French one, althoug it means pretty much the same. I have also heard a lot about Garnier. The plot of this one sounds so creative. I always wonder about the interactions between the “odd” members of couples, who have had their spouses cheat on them with the other person’s spouse. Here such an interaction sounds like takes on a very dark twist. All the more pity that novel ended so badly. I hate cliches and stock plots and writing. It was excellent up to the last third. Clearly I’m one of a few who didn’t like the end. He’s still a very good writer. Interesting! I have never read a French crime. They write excellent novels but maybe this isn’t the author to start with. I really want to read Garnier, and this is one I have (I seem to have four of his somehow, despite not having read any, which is something I normally try really hard to avoid). Still, having read your review I think I’ll try one of the others first, A26 maybe or How’s the Pain? Max, I would be curious to know what you think of this, of course but I’d say, sinec you already own four, rather start with another one. I rememeber you mentioning that you try not to “collect” books by authors and not read them. I try to stick to that as well but it’s not always that easy. Like you I’ve seen Garnier’s name all over the blogworld and am curious to know what he’s like. The writing sounds most enticing, but it’s a shame about the ending. He’s written quite a lot of books, hasn’t he? If you come across one that’s consistently good, I’d definitely give it a try. And I must have recommended Sebastien Japrisot here before, and some of Tonino Benacquista’s – they were my favourite French crime merchants! Thanks to mention them. I’ve got books by both and should read them. I’ll let you know once I find a Garnier I realy like. The writing is definitely good. I have to ditto Litlove’s suggestion for Sebastien Japrisot’s noir crime novels–they are brilliant! I’ve read most of them and should really reread them–that’s how good they are–they would stand up to rereads. I have a couple of Garnier’s books–not this one though. It certainly sounded promising. I wonder if I am getting jaded by thrillers lately as I hate it when an author caves in to a typical ending, and that’s what it sounds like happened here…. The ending was really dreadful . At least I thought so. It didn’t really fit. Thanks for reminding me of Japrisot. I bought one of his books after reading a great review on Vishy’s blog. It’s high praise if one can re-read a crime novel. Have been on holiday, so only just saw this. I really like Garnier – have read just about everything of his that has been translated into English, although infuriatingly enough I can’t seem to get hold of his books in the original French, despite living in France. This particular novel may not be quite my favourite (I liked How’s the Pain or The Islanders much more), but I actually rather liked the contrast between the intriguing, allusive, melancholy beginning and the descent into mayhem of the ending. Very Claude Chabrol. Here’s a review I wrote for CFL about it, although I would hesitate to call his work crime fiction. I just hope his other books don’t end like this. I thought it turned into a Hollywood movie. Thanks for the link. I’ll have a look. I’m definitely going to read another one. Strange you can’t find him at the book shops. A little like Marina, I’m a Garnier fan and enjoy his blend of melancholy, mordant humour and craziness. Passenger’s ending kept me guessing, but I did wonder whether the final twist was a step too far. While I liked Passenger, it’s not my favourite Garnier. How’s the Pain? could be a good one for you to try next as it’s far from formulaic, and if my memory serves I think it’s the most compassionate of the Garniers I’ve read. Maybe if it hadn’t been my first I would have reacted differently to the ending. Thanks for the suggestions. I’ll kepp them in mind. I liked it a lot and I’m sorry you loathed the ending. Like you I thought the scene with the legos was hilarious. Apparently it’s not his best, so, good for us, we have better ones ahead of us. I really want to read more of him. When I read the end, I must admit, I was surprised you liked it. It’s so Hollywood thriller ending.